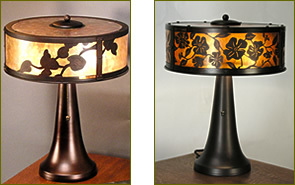 Welcome to the Mica Lamp Company Featured Items area. The products below are brand new designs now available from Mica Lamps. Please click an image below for a larger view and size specifications, or click a button below to view similar items from our catalog. Weathered copper finish. UL wet location. 15 lbs. Hefty construction of steel with heavy relief cast iron window frames. 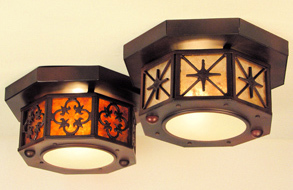 These octagon fixtures are available in 4 distinctive traditional designs. UL Damp Location / 8 Lbs. Mid-Century Modern Design is interpreted in random patterns of Mica Mineral squares and rectangles. 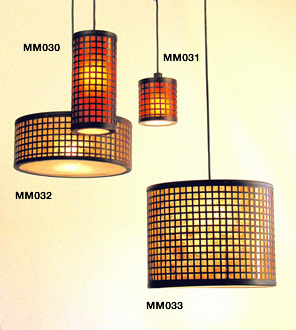 Each mica lens, which varies in shades of amber and buff color tones, is placed inside the rectilinear metal grid of each Mondrian lamp shade. 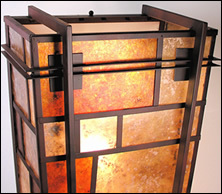 All Lamps come with Weathered Copper matal finish. These new Modern Mica Designs® are part of the mid-century lighting line that includes Mondrian chandeliers and wall sconces (see below). The square pattern is a heavy steel mesh that is layed over the mica mineral lens; choose almond mica or orange mica. Mica mineral taken to new heights. The Mica Lamp Company has developed a new shape out of an ages old material: Mica Mineral. Domes - a single molded unit of mica mineral. The natural, stone texture of mica mineral in a smooth dome allows these chandeliers to emit a natural warm amber glow without the weight and fragile nature of glass or alabaster stone. 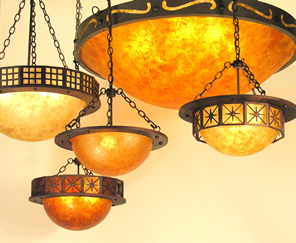 The "Masters of Mica" at the Glendale California shop build each dome shade in colors orange-amber or almond-natural. Heavy steel relief by precise CNC cutting. The 4" slim profile add a modern feel to a classic Art Noveau motif. New addition to Mica Lamps popular Storybook line. 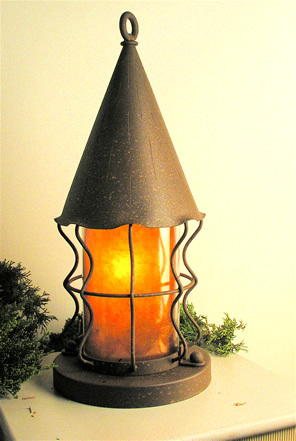 Lantern is steel with zinc plating and exclusive Storybook Rust powder coat finish. Base is made of solid copper. 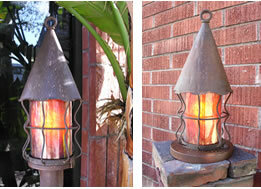 Introducing Classic Casting Box Lanterns, made at the Mica Lamp Company, Glendale, California. 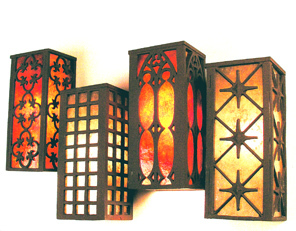 High design box lanterns with 4 patterns in heavy relief cast iron windows. Authentic rich mica mineral lens is treated to withstand wet location elements. 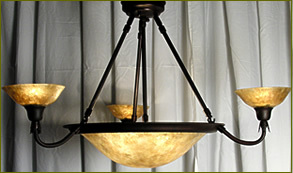 Introducing Classic Casting Pendants, made at the Mica Lamp Company, Glendale, California. High design pendants with 4 patterns in heavy relief cast iron windows. Authentic rich mica mineral lens. 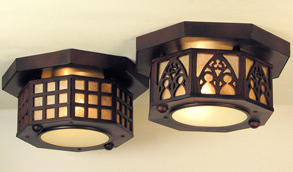 High design lanterns with 4 patterns in heavy relief cast iron windows. Authentic rich mica mineral lens is treated to withstand wet location elements. Mica Lamp Co. has updated a classic desk lamp; plug in; charge-up your laptop, iPod, or pencil sharpener. Heavy, sturdy construction. 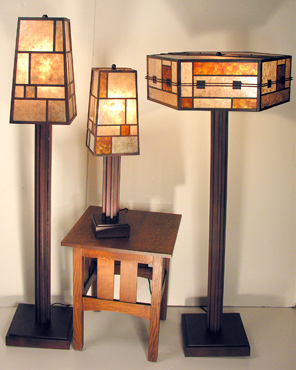 More modern styles from Mica Lamp Co. Mondrian style circa 1950. 14" H x 8" W x 4" Ext. Like our popular Mosaic Table Lamps, these new floor lamps offer retro styling combined with the natural warmth and rich texture of mica mineral. Four new Fan and Light-Kit models in Dark Copper finish with classic rivet styling on fan body and blade holders. 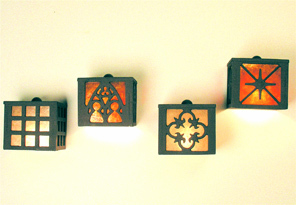 Light-kits have traditional designs cast into heavy relief iron windows: Abbey, Fleur, Star and Matrix. Choose Mica mineral lens color: Orange or Almond. 2 x 60 watts. Lifetime warranty on the most powerful motor available (enhanced "K55" model). Introducing pendants that look heavy in weight with deep relief. These four traditional design motifs are cast with deep "forge" and "distress" markings. 3 sizes available: 21" dia (shown), 26" dia and 32" dia. Lamping: 3 x 60 watt edison base incandescent. Choose available mica mineral lens colors: Orange or Almond. Authentic Mica Mineral Bowls with heavy cast iron "hammered" ring. Weathered copper finish. Classic Cast Iron designs and authentic mica mineral bowl. Natural stone richness. Iron is rustic and hammered in appearance with heavy, deep relief. 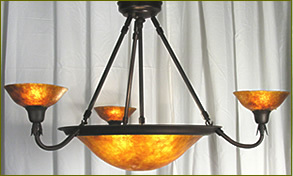 Modern Styles from Mica Lamp Company. Mondrian style, circa 1950. Modern Art for the wall. Comes with many shadings of orange, amber and almond mica mineral. Classic Cast Iron designs and authentic mica mineral. Natural stone appearance. Cast iron crowns are rustic and "hammer marked". Traditional motifs in heavy deep relief. Weathered copper finish. 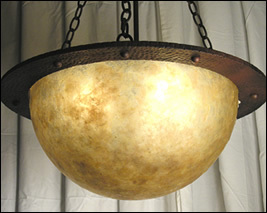 Mica mineral bowl lens is a new innovation from the Mica Lamp Company. Light weight and with all the natural warmth and romantic ambiance of real mica mineral. 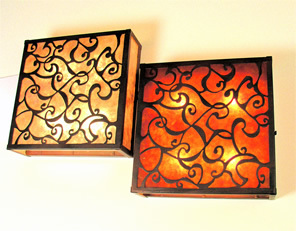 American Arts & Crafts Style, all copper, rivet construction, authentic mica mineral shade with copper filigree overlay. Made in the USA. All shades have embossed serial number. 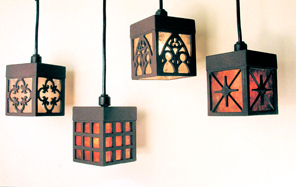 2 new additions to the Storybook Lighting Collection of 42 models from the 1920's Architectural movement depicting Old English and French Cottage motifs; Whimsical and Medieval. Steel and Iron Construction with exclusive Storybook Rust powder coat finish. Made in USA - Glendale, CA. Several new pieces have been added to our whimsical Storybook Collection. 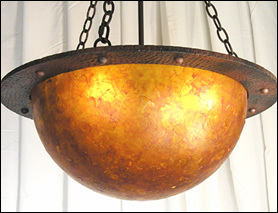 Made of Steel & Iron, the modeled rust finish gives an effect that is natural and makes each piece different. The finish is a weather durable powder coat over zinc plating. The mica is offered in authentic Orange Amber or Almond Natural mineral lens.